For this post, I’m going to try something a little different. 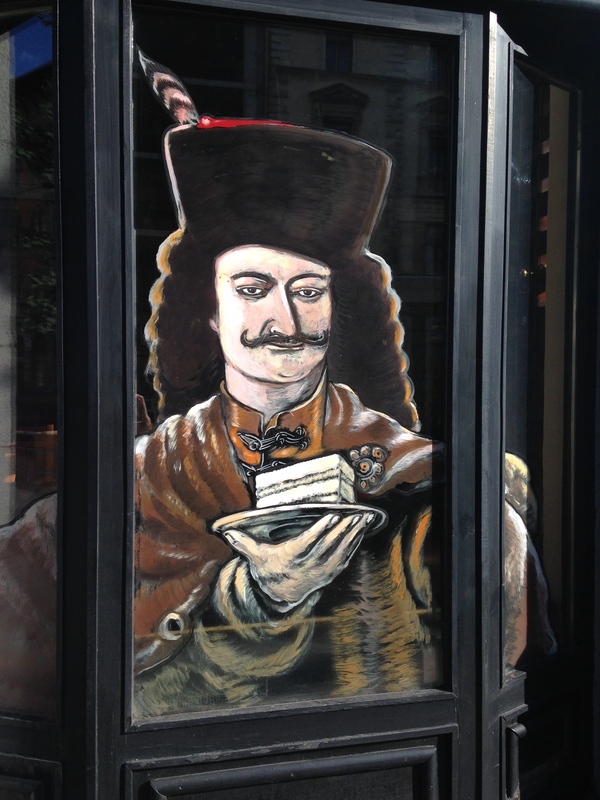 I was in Budapest for a total of 6 days and did and saw a lot, far too much to fit in a single post, especially the long-winded, diary-style posts I’m used to writing. 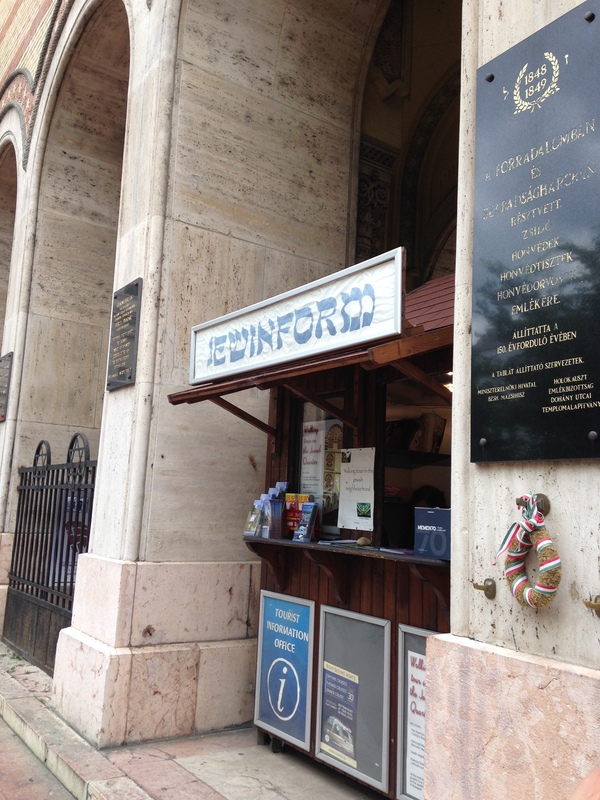 For this post, I’m going attempt a briefer post that will hopefully highlight the awesome that is Budapest with plenty of photos! 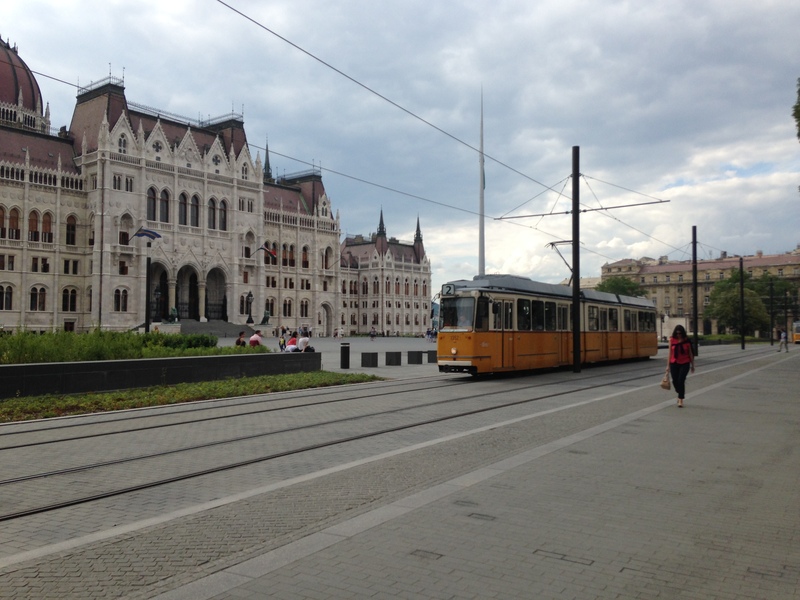 While on my Eastern European adventure last year, I completely fell in love with Budapest. It has everything I could want in a city: the cosmopolitan glamour and elegance of Western Europe and the ancient quality of Eastern Europe, with some Cold War mystery and sorrow tossed in. Combine that with an efficient public transportation system, a language that is insane to pronounce, and a devil-may-care party attitude, and you’ve got yourself one hell of a town. My good friend Jill, also a writer, blogger, and traveler, accompanied me. In no particular order, here’s a smattering of things we saw and did. When I travel, I love seeing performances of any kind. Perhaps it’s the theater nerd in me, but art and performance is such a huge part of culture and a great way to experience a new one. Cosmopolitan Budapest is the perfect city for this. We wanted to see an opera, but the Grand Opera House happened to be dark when we were visiting. 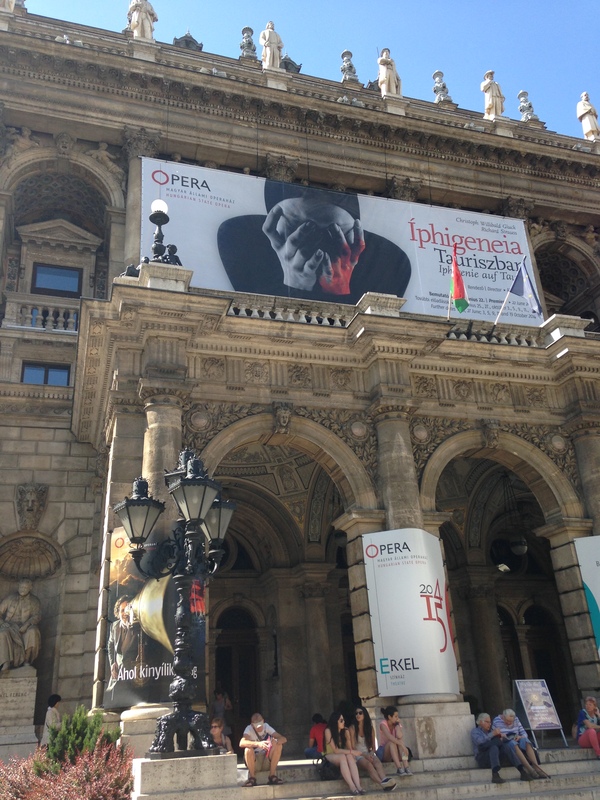 However, there was a ballet showing at the Erkel Theater, the biggest theater in Budapest and the newer, more modern sister to the Grand Opera House. It’s always worth checking to see if you can get discounted same-day tickets to a performance, and this time we snagged $15 tickets sitting in the front row of the balcony. 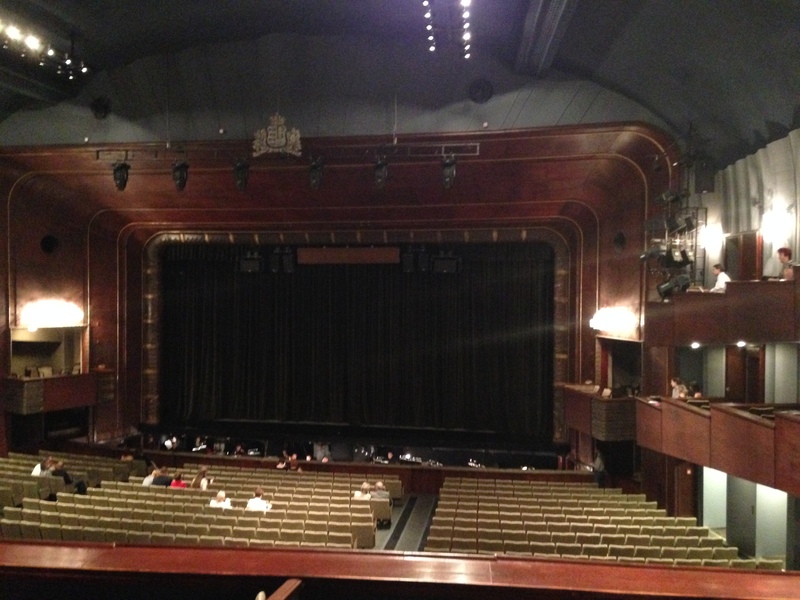 The show that we saw was an incredible program of 5 short modern ballets. Each piece was different. Some were moving to the point of tears, others surreal and quite funny. I always forget exactly how athletic ballet dancers are until I have the privilege of seeing ballet again. It was a spell-binding performance. 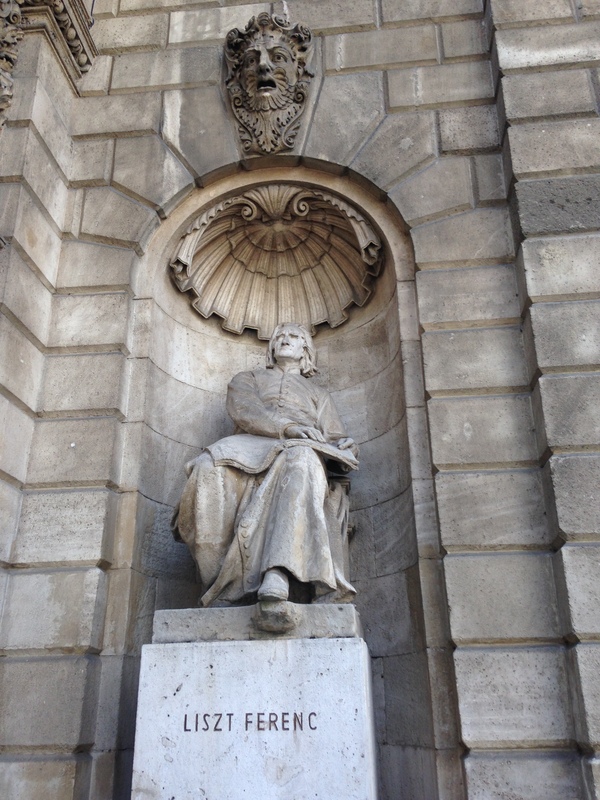 Statue of Franz Liszt at the Grand Opera House. Hungarians are obsessed with him! 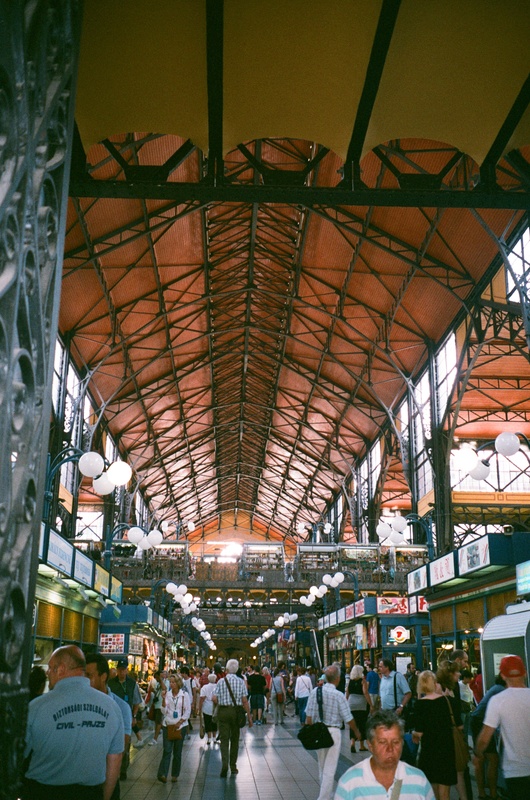 A huge indoor market set in a gorgeous building from 1897, the Grand Market Hall is the place to get any souvenirs one could want in Hungary. The main floor is all market stalls, with meats, produce, bakeries, and spices. We picked up some paprika to take home as souvenirs from Csardi es Csardi, in both the sweet and spicy varieties, as well as salami and rolls for a picnic. 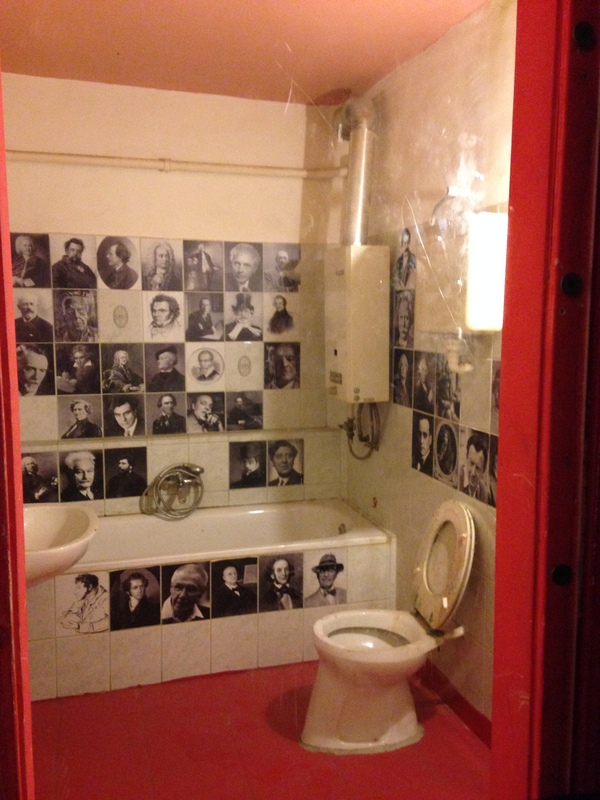 The upstairs stalls vary from the tackiest of postcards and shot glasses to fine Hungarian amber and cut crystal. 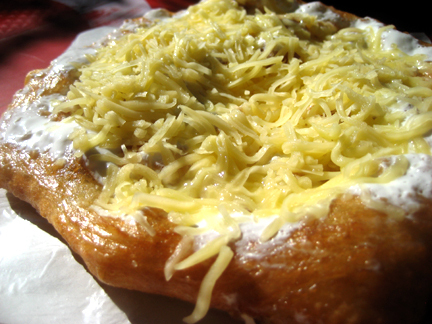 We visited the cafeteria for langos, a Hungarian treat that basically consists of a huge piece of fried dough with toppings. I had sour cream and cheese, the traditional combination, but Jill’s sweet choice of apricot jam and powdered sugar looked delightful as well. Is it just me or is everything in Budapest “grand” and “great”? 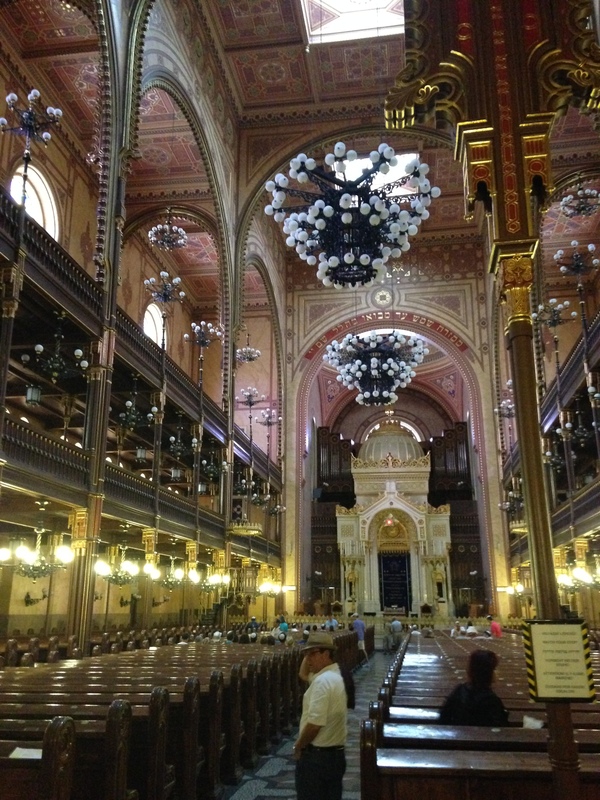 As the second-largest synagogue in the world, this one certainly lives up to its name, and is a must-visit for any Jews passing through Budapest, like myself. 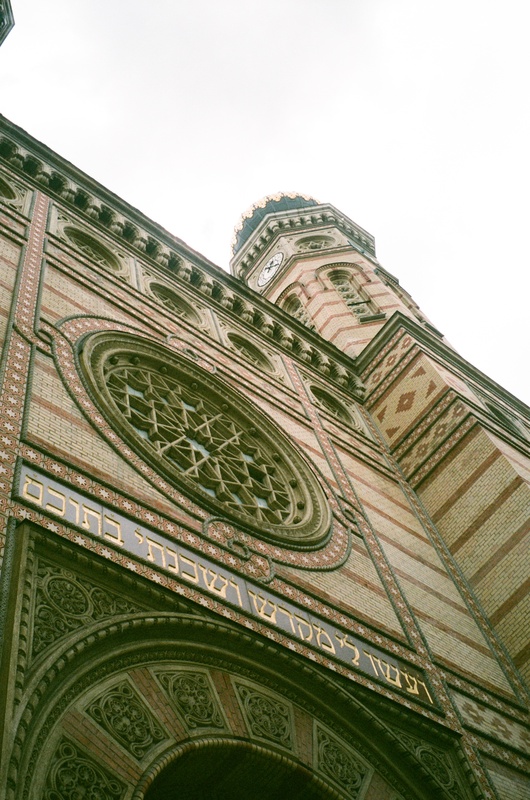 The synagogue is massive, ornate, and Moorish in design, since Hungary’s Jews are primarily descended from Spanish Jews that fled the Spanish Inquisition. The ticket to the Great Synagogue included a visit to their lovely Holocaust Memorial Garden with a silver statue of a weeping willow. Each of the leaves of the statue is etched with the names of Holocaust victims. Also included was a stop at their small museum with artifacts relating to Jewish life cycle events and holidays. The Jewinform booth, for all your Jewish Information! On this trip I became a convert to free walking tours. Before traveling by myself, I never took the time to investigate stuff like this and would just have my nose in my guidebook and guide my companions. Since discovering these tours, however, I am now totally on board. the guides were very enthusiastic and knowledgeable, and I got to learn about the city, get some exercise, and meet new people. Best of all, it was free! Although if your guide is good definitely tip them and keep such opportunities open for future travelers. 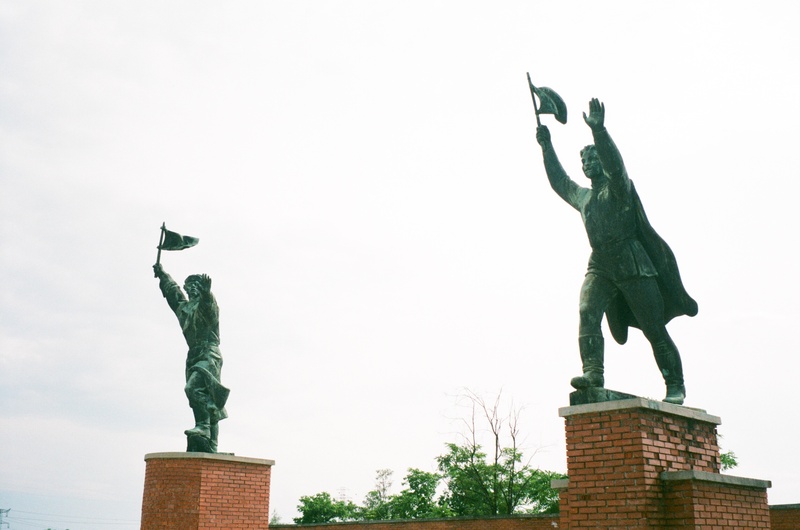 This tour was specifically about the Budapest’s Communist past, and our Hungarian guide was a perfect mix of informative and entertaining. 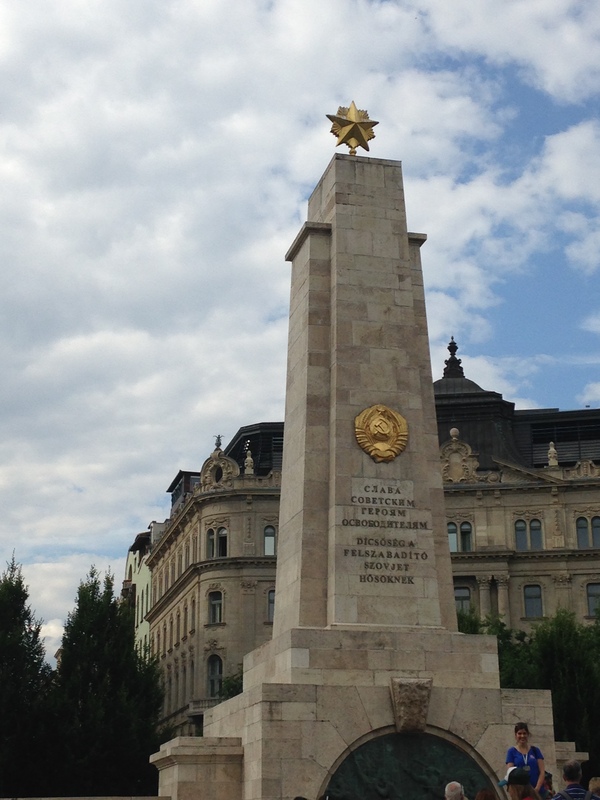 We walked to various sites around the city, and she told us about various aspects of life during Communist times, including housing, TV and radio, travel, views on religion, and the major events that occurred in Hungary around that time. I particularly found the anecdotes on travel interesting. For instance, it was difficult to travel to countries that were not Communist, but inside Communist countries it was relatively easy. Because of this, families from East and West Germany that were separated by the Berlin wall would use Hungary, a more easy-going Communist country, as a meeting point. 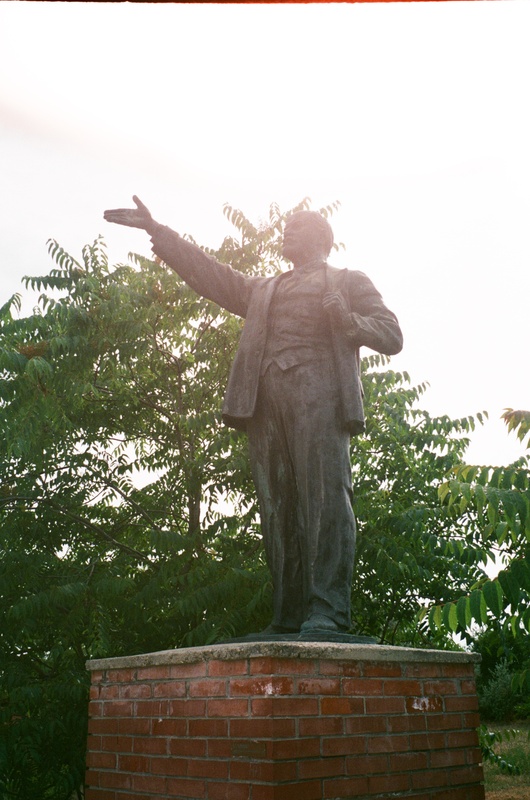 Statue of Imre Nagy. During Hungary’s uprising of 1956 he was elected to be Prime Minister, but imprisoned, charged with treason, and executed in 1958 after Soviet troops invaded. Today he is considered a symbol of freedom. Underneath Budapest lies subterannean pools of warm mineral water, and “taking the waters” is a city-wide past time. 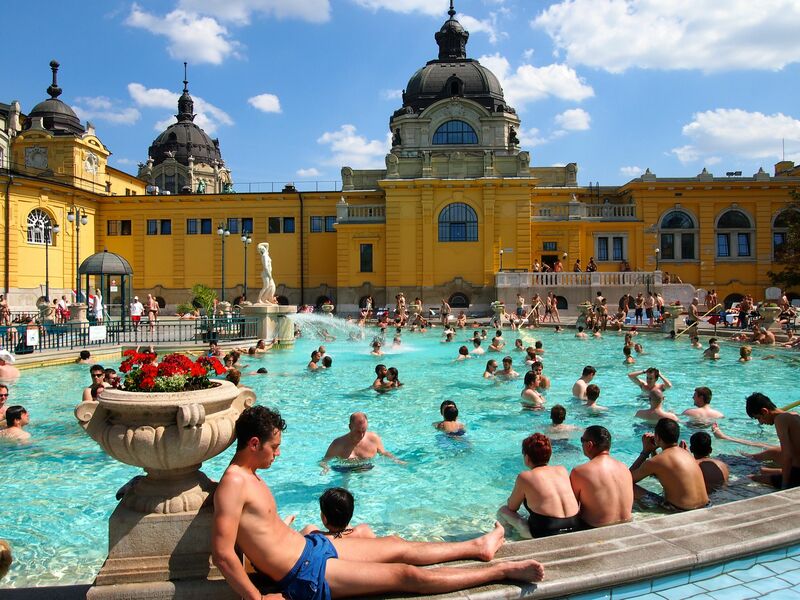 Out of the many bath houses to be found, we chose to visit the Széchenyi Baths in the City Park. It was an absolutely fabulous experience. 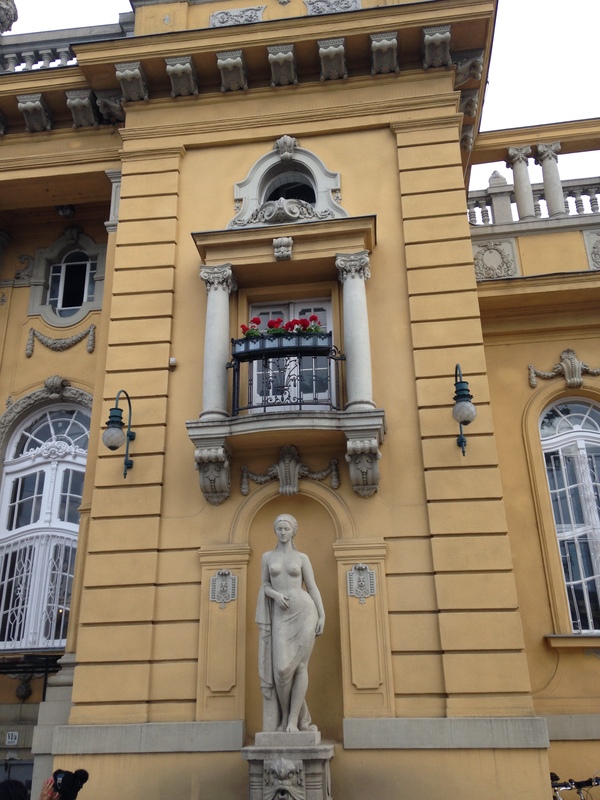 Housed in a beautiful yellow Neo-Baroque building from 1913, it is one of the most scenic. The baths have many different sections, but the place to be in the evening when we visited was the outdoor pools. There are three large outdoor pools surrounded by colonnades and marble statues: a warm relaxation pool, a lap pool that you cannot enter without a swimming cap and a serious swimming attitude, and a cooler “fun” pool with jets, fountains and rapids. Want to let your cares melt away as you watch the sun set and attractive tourists lounge? Go to the warm pool. Want to feel like a kid again and be surprised by the girlish laughter of brawny bearded men? Go to the fun pool. We also enjoyed exploring the labyrinthine interiors, with small saunas and soaking pools of different temperatures, including a chilly plunge pool. The icy plunge pool sounds like something you’d never ever want to get into, but trust me, after 2 or 3 warm mineral pools and saunas, nothing feels better. It’s also good for your circulation and skin. It really felt like being in a Roman bath house! We stayed at the baths for 3 hours, and easily could have stayed longer. I’ve spoken a bit about ruin pubs in a previous post, but they really are amazing. They are like any old bar or pub, but in an abandoned building, stuffed with art and graffiti and a heavy punk-rock spirit. While in Budapest, we went to Szimpla, the original ruin pub, 3 different times, and hit up another pub, Instant, on a Monday, the second to last night of our trip. Instant is a trip. 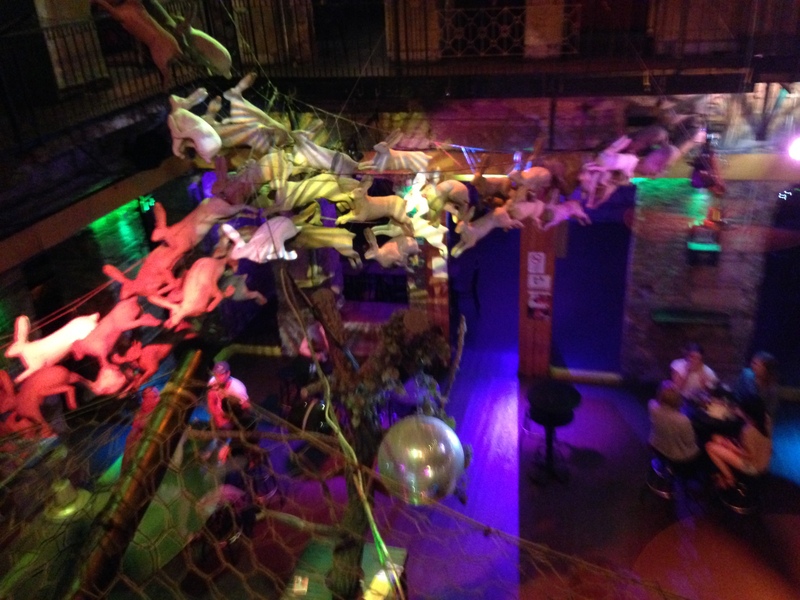 Set in a former apartment building, the Instant boasts 7 dance spaces, as many bars, and 25 different themed rooms to explore. Each of these rooms is done up with a different style and crammed with different art, and feels like a living art installation that changes as the night goes on and different party people come and go. 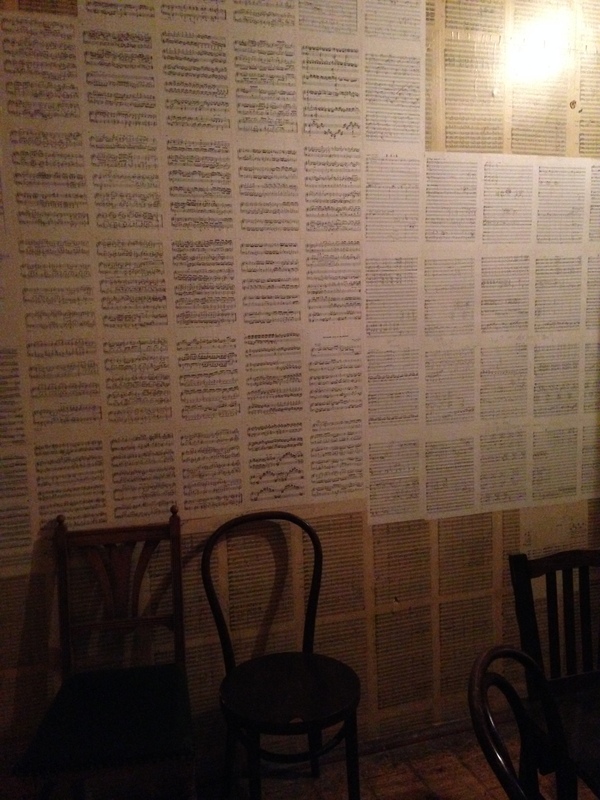 My favorite was the room wallpapered in sheet music with a sealed-off bathroom tiled with pictures of composers. The center courtyard was trippy as well. It was meant to be an enchanted forest, and had a flying rabbit statue as well as an owl with a woman’s torso and horse’s hooves lit with splashes of psychedelic colored lighting. At some point in the night we discovered a hidden dance floor with a good DJ, and danced our little hearts out until the wee hours. I also had the biggest punk rock moment of my trip that night. In a surge of dance-fueled intensity (ie flailing with abandon) I brought my elbow down on an unwitting Indian guy’s beer glass so hard that I broke the glass and bled on the dance floor. Rock on! Our last sight in Budapest was a little far out, but completely worth it. 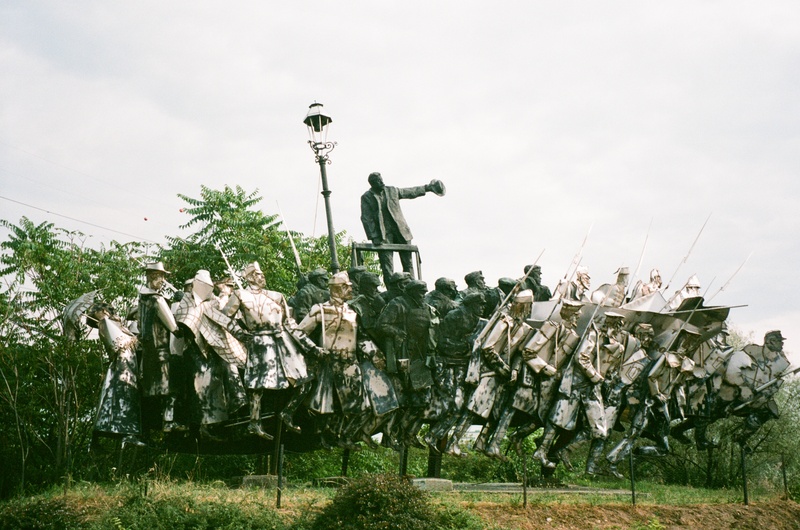 When Communism was falling in Hungary, and the statues of dictators were being destroyed, some rich guy in Budapest snatched up a bunch and put them in a park on the outskirts of town. The design of the place is meant to echo the ridiculousness and futilism of Communism, such as the poor layout that has you zigzagging across the park to see the sights in their “proper” order. It’s absolutely brilliant and a must-see for anyone interested in Cold War history or Communist leaders. They also sell tons of overpriced Commie Kitcsh (I found much better bargains in Belgrade) and have a “Best of Communism” CD playing to get you in the mood. It’s great fun, and you are encouraged to take as many silly photos as you’d like. 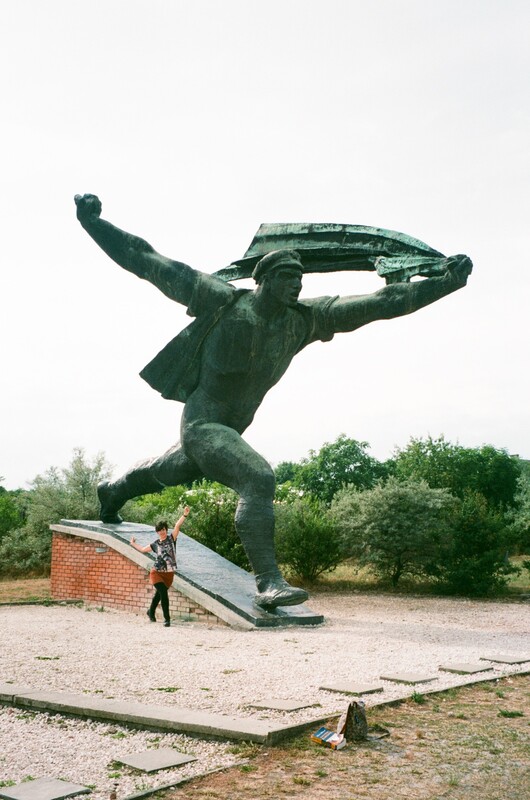 Me, accompanying the Soviet Worker as he hurtles towards the future! There you have it travelers! 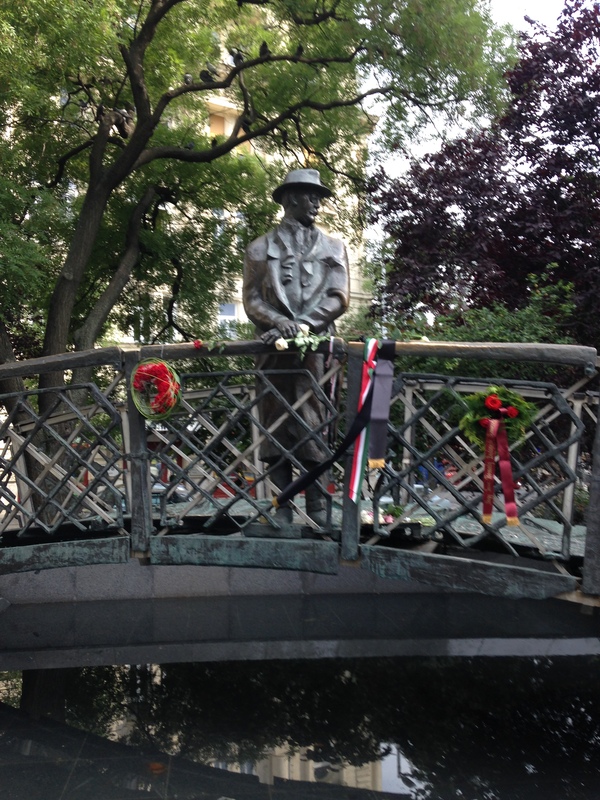 Somehow, I thought I could make this post shorter than usual, but as you can see Budapest just has so much to offer. As a whole, I highly recommend Eastern Europe. The region has so much to surprise and delight, and I absolutely fell in love. I cannot wait to go back!